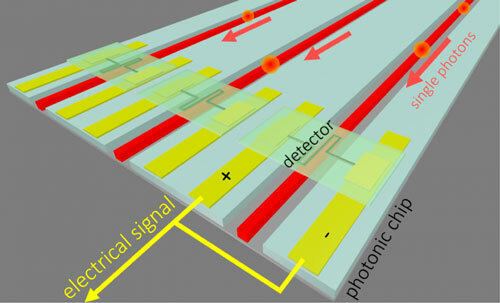 (Nanowerk News) A team of researchers has built an array of light detectors sensitive enough to register the arrival of individual light particles, or photons, and mounted them on a silicon optical chip. Such arrays are crucial components of devices that use photons to perform quantum computations. Single-photon detectors are notoriously temperamental: Of 100 deposited on a chip using standard manufacturing techniques, only a handful will generally work. In a paper appearing today in Nature Communications ("On-chip detection of non-classical light by scalable integration of single-photon detectors"), the researchers at MIT and elsewhere describe a procedure for fabricating and testing the detectors separately and then transferring those that work to an optical chip built using standard manufacturing processes. 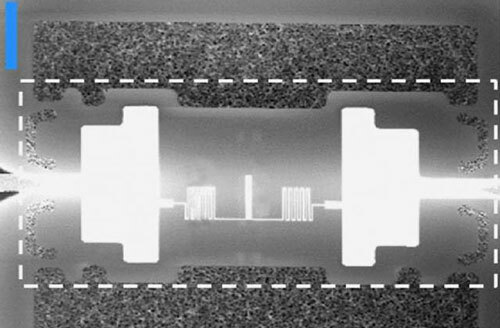 One of the researchers' devices during its transfer to an optical chip. Gold electrodes are deposited on a silicon nitride film at either end of a niobium nitride light detector.